Unfortunately, very little has been revealed about what, if anything, was agreed upon at that summit. At the very minimum, the world’s citizens need Trump and Putin to agree to extend New START (Strategic Arms Reduction Treaty) beyond 2021, when it is due to expire. We need your help to make that happen. 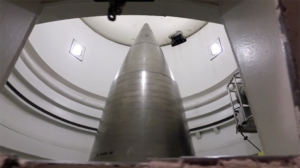 New START limits the numbers of deployed strategic nuclear weapons on both sides to 1,550. If it is not renewed, the sky is the limit. Fortunately, three very influential senators, the highest-ranking Democrats on the Senate Foreign Relations, Select Intelligence and Armed Services, introduced a bill to demonstrate Senate support for extending the New START Treaty. Contact YOUR senators and urge them to cosponsor this bill, S. 3169, originally cosponsored by Senators Robert Menendez (NJ), Mark Warner (VA) and Jack Reed (RI).